The rich, Obama insists, aren't paying their "fair share." This by itself seems odd given that the top 1% of Americans pay 40% of all federal income taxes; the next 9% of income earners pay another 30%. So the top 10% pays 70% of the taxes; the bottom 50% pays close to nothing and in some cases receives a rebate on taxes not paid. Does this indeed seem unfair--to the rich. As we will defined Fairness in Chapter 3, it is about being fair to all. So what is fair share and what are the unintended consequences of raising tax rates? Do we need tax reform? Yes. The flat tax is a concept that seems good for all generations while promoting economic growth. Even the sentiments in Obama's State of the Union Address (SOTU link) cares the emotion of unfairness to an extent that ethics seem to be in question here. Obama has raised the notion that Buffet's secretary pays a higher tax rate. Is this true? The answer is not likely, unless she makes a lot of money. Today, top earners—the 250,000 people who earn $1 million or more—pay 20% of all income taxes, and the 3% who earn more than $200,000 pay almost half. Almost half of all filers pay no income taxes at all. Clearly they earn less and should pay less. There's one small problem: The entire Buffett Rule premise is false, as the table below shows. In 2008, the last year for which such data are available, the IRS reports that those who made more than $1 million in adjusted gross income paid an average income tax rate of 23.3% the near highest percentage. The basic assumption that taxing the rich more will significantly reduce the deficit while not affecting the middle class or economic growth is simple wrong. It seems to be more of a political strategy than a fairness or financial one. The negative impact of a Buffet tax could be quite worse. Imagine a policy that is so unfair it is being sold on the notion of fairness. Imagine such an insane attempt to fuel class warfare that all lose. Imagine a diabolical plot to prove history incorrect. Just imagine the proposal of the Buffet Rule by Obama. It is all about punitive policies against the rich for the express purpose of gaining more central power. Don't we have a spending problem and not a tax problem? The recent news on the Buffet and Obama Rule is nothing more than the class warfare described here. In the news is that Obama pays a lower rate than his secretary, who apparently makes a good deal of money. Along with the supposed higher rate for Buffet's secretary this can only lead us to several conclusions: the high paying secretaries do not give much money to charity and that Obama and Buffet are good at reducing their taxes. In addition, the case for the Buffet rule is eroding. In WSJ, the overall tax policy is becoming more clear. With the modifications in the AMT, the original Buffet Tax, being reduced the deficit will increase not decrease with this overall policy. When President Obama announced the idea, he said it would help "stabilize our debt and deficits over the next decade." Then came the inconvenient revelation that the new 30% millionaire's tax would raise only $46.7 billion over 10 years, and would leave about 99.5% of the deficit intact in 2013. It was a far cry from "stabilizing the debt." What would the Buffet Rule do to raise taxes? Raising the rates as Buffet proposes would raise by several estimates up to $36 - 50B over a 10 year period, which would fund the deficit alone for 12 days. This is not overall spending just the deficit spending. With the top 10% covering a huge percentage of the total tax revenue from income taxes, and the bottom 50% of tax filers paying close to zero, what is the concept at work here? Is it fairness or an attempt to increase government spending while reducing the income distribution? One implication of the Buffett rule is that all millionaire investment income would be taxed at the shareholder level at a minimum rate of 30%, up from 15% today. The tax rate on investment income from corporations would rise to 54.5% from 44.75%, a punitive tax on start-up or expanding businesses. A decade later Bill Clinton agreed to cut the rate back to 20% as part of the balanced-budget deal with Newt Gingrich. Capital gains revenues soared, helping to balance the federal budget. Mr. Buffett stated in his op-ed that he paid $6,938,744 in total income and payroll taxes in 2010, representing 17.4% of his taxable income, which puts his taxable income just under $40 million. Although certainly a fantastic sum, $40 million actually understates Mr. Buffett's income in 2010 by more than 250-fold. The tax rate would increase a large amount. A White House statement released in January 2012 defined the rule as part of "measures to ensure everyone making over a million dollars a year pays a minimum effective tax rate of at least 30%... implemented in a way that is equitable, including not disadvantaging individuals who make large charitable contributions." A report by the Congressional Budget Office in 2007 is widely used as a source of data for conservative arguments against the 'Buffet Rule.' According a January 20, 2012 Wall Street Journal editorial, the CBO report states that in 2007 "the average income tax rate paid by the top 1% was 18.8%, compared to 4.2% for Americans in a broadly defined middle class from the 21st to 80th income percentiles." It goes on to quote the report as saying, "
As for all federal taxes, CBO found that in 2007 the top 1% paid an average rate of a little under 30%, compared to 15.1% for middle-income earners." The graph below shows the percent of the total taxes paid by various income groups. The tax share graph at left indicates also how the share of taxes is broken down for various fractiles. 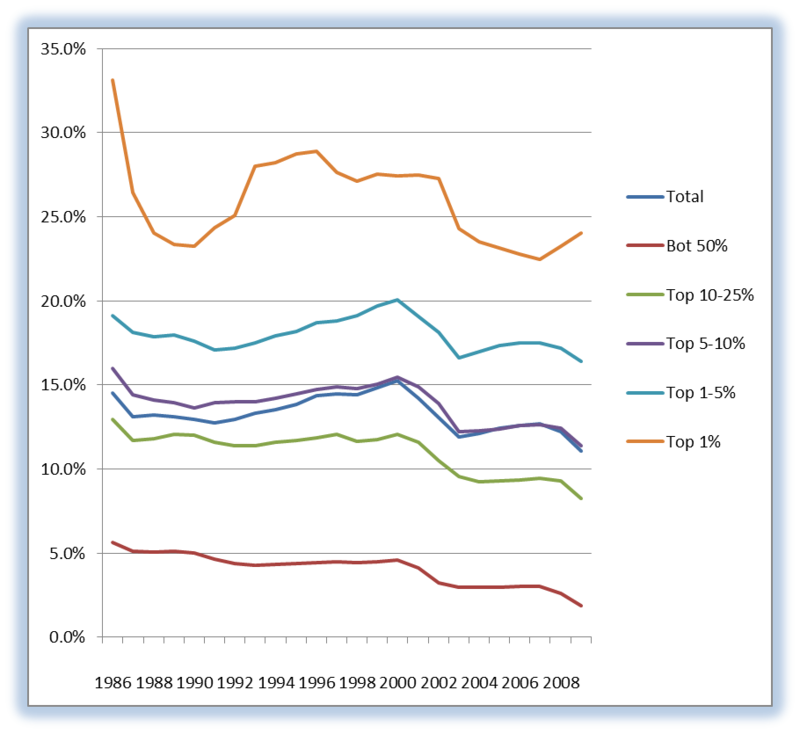 The top curve is the % share of the top 1%. The only other positive slope curve (meaning that the percent share was increasing over time) is the segment from 1 - 5%. 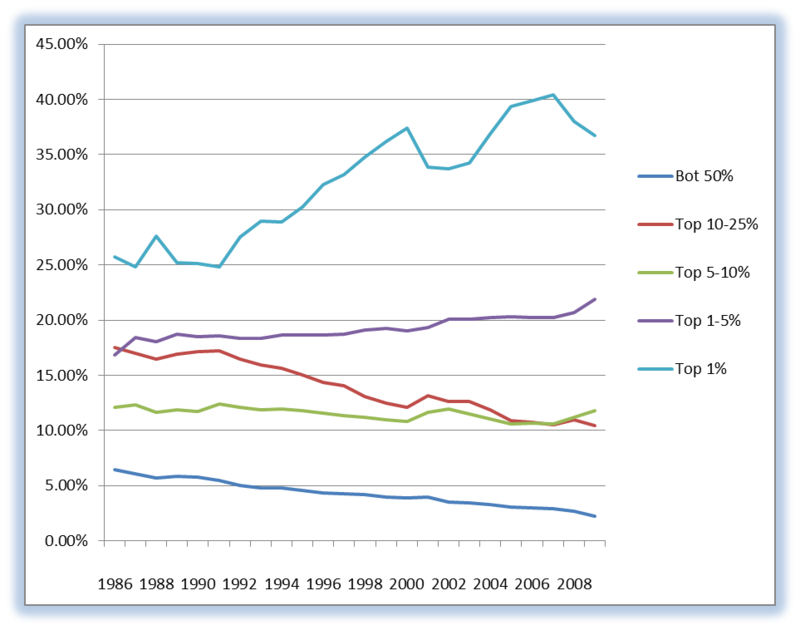 With the bottom curve sloping downward the bottom 50% paid around 3% of the total taxes, nearly half of the share paid in the late 60's. Clearly when the % share of taxes is a fraction of the income share for most of the income distribution, it is very difficult to assume that the top 1% is not caring their share. However, more liberal commentators like NY Times columnist Paul Krugman tend to cite the statistics on the top 400 income earners. In a January 20, 2012 Op Ed he wrote, "Since 1992, the I.R.S. has been releasing income and tax data for the 400 highest-income filers. In 2008, the most recent year available, these filers paid only 18.1 percent of their income in federal income taxes; in 2007, they paid only 16.6 percent." If enacted, the rule change would result in $36.7 billion ($0.0367 trillion) per year in additional revenue, according to a January 2012 analysis by the Tax Foundation, a conservative think tank. An alternative study released that same month by the Citizens for Tax Justice, a progressive think tank which favors the change, stated that the change would add $50 billion ($0.050 trillion) per year in revenue. In comparison, the 2011 U.S. federal budget request by President Obama had a requested $1,560 billion ($1.56 trillion) deficit. Mathematically, $36.7 billion is 2.4 percent of that amount while $50 billion is 3.2 percent. 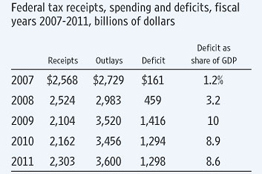 As one can see in the table above, the deficit is growing while the receipts are not increasing. This would normally be called a spending issue and not a revenue issue. The taxes gathered as a result amount to close to 9 days of financing just the annual deficit. So can we agree that the real issue is spending? 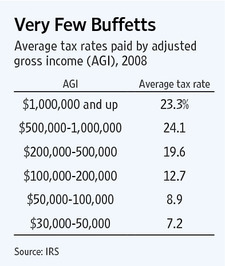 So perhaps it is not true that Buffet's secretary pays a higher tax rate. The tax rate at the high-end is still larger than in any other group. Since the income is also higher it should be no surprise that the tax burden does fall on the rich. They show that taxpayers earning an adjusted gross income between $100,000 and $200,000 pay an average rate of twelve percent. This is below Buffet’s rate; so she must earn more than that. Taxpayers earning adjusted gross incomes of $200,000 to $500,000, pay an average tax rate of nineteen percent. Therefore Buffet must pay Debbie Bosanke a salary above two hundred thousand. the table at right shows the tax rate at for the different income levels for 2008. 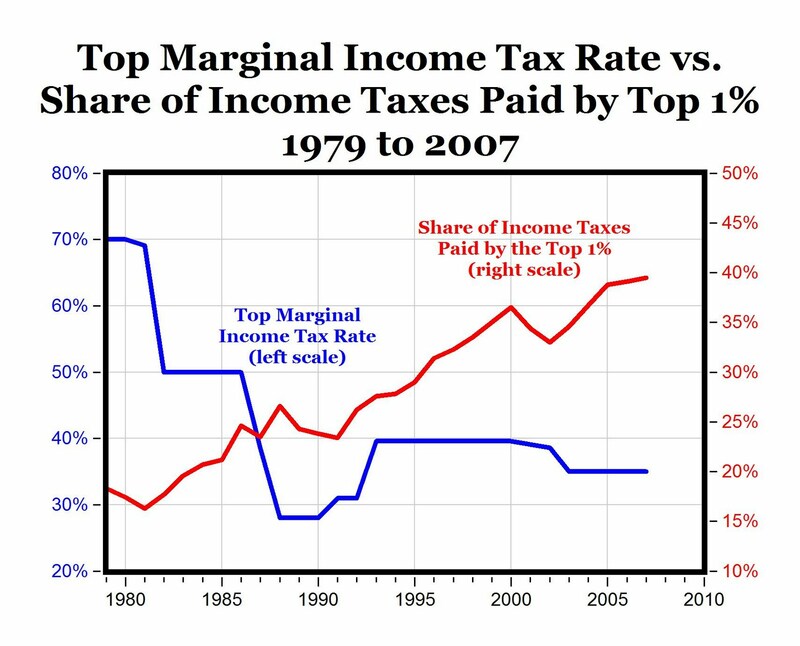 The graph at left shows how the tax share paid by the top 1% of income earners has risen, in generally in near opposite fashion to the marginal tax rate. The tax rate is higher and the taxes paid are much higher than the percent income. This data has been presented by a wide number of presenters in a wide number of media. Why is this question so difficult for the general public to discuss. The proposed version of taxes paid by this Administration is simple mistaken. The Treasury Director happened to say that the rich should pay more for the privilege of being an American. Clearly there is a distinction between a right and a privilege. The confusion is quite hard for any good student of this issue to either defend or agree with. In a word, President Obama lied. He used Warren Buffett and his secretary as props to support his continued class warfare rhetoric. Please make it stop! The question of not telling the truth further clouds the issue. The core issue is what do the rich pay and how do we define what is fair. The irony for rich is often that ducking is more productive than fighting. It is good do not risk it. On tax Rates: Income-tax rates for top earners will rise to 39.6 percent from 35 percent in 2013 and rates on capital gains and dividends also may rise, unless Congress acts. The survey didn’t ask what level of income or assets should trigger higher taxes, according to Alan Aldinger, a PNC spokesman. About 41 percent of those surveyed said they would change their investment strategy in response to an increase in taxes, and 24 percent said they would reduce commitments to philanthropy. Nevertheless do taxes still need to be raised? The video details why this issue can best be framed as a spending problem and not a tax problem. Since the very rich pay a great deal of the total tax revenue, there never seems to be a definitive statement about how much is too much as far as taxes paid are concerned. The deficit as is shown will not be covered by the Buffet Tax, despite all of the rhetoric or posturing. The annual fed revenue gain by the Buffet tax is in the range of mid-30 billions of dollars to low 50's. This does not even cover 2 weeks of the current annual deficit, leaving 50 more weeks to be covered by today's children. So the question of fairness rises again. Is the notion of the Buffet tax fair to your kids or is a spending reduction and a flat tax more fair to all generations?